The Hawaiian bobtail squid Euprymna scolopes hosts bioluminescent bacteria within its special light organ. Photo courtesy of gatech.edu. Every month we showcase a relationship between two or more species or groups of species that can be considered a mutualism: a relationship where both members benefit.This month’s mutualism is the Hawai‘ian bobtail squid Euprymna scolopes and its bioluminescent bacteria Aliivibrio fischeri. The Hawai‘ian bobtail is a small (1.5”), nocturnal squid endemic to the Hawai‘ian Islands. Allivibrio spp. are gram-negative facultative anaerobes (they don’t need oxygen) typically found in seawater; some relatives can cause foodborne illnesses related to consuming shellfish. The bioluminescent bacteria Aliivibrio fischeri provides counter-illumination for its host squid in return for food (sugar and amino acids) and shelter. Photo courtesy of toxita.cz. Hawai‘ian bobtail squids provide A. fischeri with sugar and amino acids (building blocks of proteins). 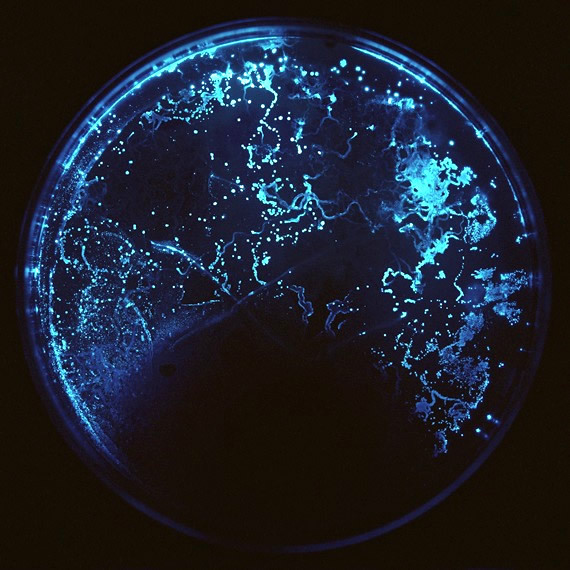 In return, the bacteria bioluminesces (produces light). A. fischeri inhabits a special light organ within the mantle (main part of the body of the squid) which reflects and focuses light downwards. The squid uses its ink sac (also within the mantle) to control the intensity of the light produced by functioning as a diaphragm around the light organ. So how is this beneficial to the squid? Counter-illumination. Counter-illumination is a method of camouflage where an animal produces (or hire bacteria to produce) light to match an illuminated background. 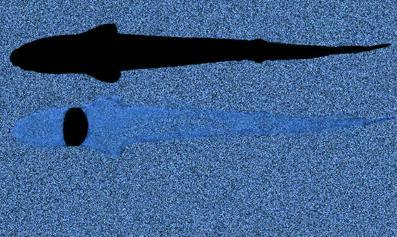 In marine animals, counter-illumination breaks up the dark silhouette produced by down-welling light (light from above). A predator looking up at a Hawai‘ian bobtail will see (or not see) a light underside on the light background of the ocean surface lit by the moon making it much more difficult to spot and attack. Creative plating job of another closely related symbiotic bioluminescent bacteria Photobacterium phosphoreum. Photo courtesy of biology.pl. Hawai‘ian bobtails can control the amount of light coming out of the light organ by changing the shape of the ink sac as well as by reducing the amount of oxygen given to the bacteria. While the oxygen is unnecessary for sustaining A. fischeri (remember they are facultativeanaerobes), it is necessary for the bioluminescent reaction. Squid detect light levels through the use of multiple organs situated on the top of the animal and can adjust the light levels within minutes. 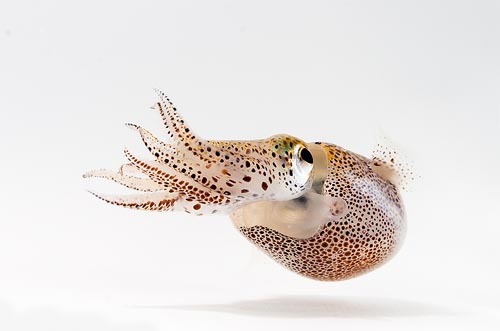 Having a culture of A. fischeri within the light organ is vitally important for the survival of Hawai‘ian bobtail squid. Newly hatched Hawai‘ian bobtails lack the necessary bacteria, but acquire A. fischeri from the surrounding seawater within 24 hours after hatching. The squid must “filter” the water of all other species of bacteria before A. fischeri can colonize and start the bioluminescent process. The light organ of a newly hatched squid. Aliivibrio fischeri enters the light organ though pores on either side of the organ. These can be seen as the three small holes on the left and right side of the image. The blue color is produced by the bacteria. Photo courtesy of PNAS.org. So how does A. fischeri get into the squid? Bobtail squid secrete mucus around the entrances to their light organ which captures a variety of bacteria. A. fischeri excels in the mucus, out-competing the other bacteria. As bacterial populations start to increase, A. fischeri migrate up into the entrances of the light organ where they face heavy loads of antimicrobial compounds such as the enzyme squid halide peroxidase. A. fischeri shuts down the production of this enzyme by capturing the molecule that reacts with the enzyme (hydrogen peroxide) and then colonizes the light organ. No. Despite the effort to obtain these bacteria, Hawai‘ian bobtails “vent” (release forcibly) up to 95% of the cells at dawn. While this behavior doesn’t help the bacteria (no home is no good), the squid may benefit from not having to provide the bacteria with sugars and amino acids. During the day Hawai‘ian bobtails bury themselves in the sand and remain inactive, not needing the bacteria to protect them from predation. Throughout the day, the number of bacteria within the light organ slowly increases until the full complement of bacteria is attained by dusk when bioluminescence is needed for predator evasion. Photo courtesy of Mattias Ormestad of kahikai.org. Culturing methods for both species in a laboratory setting are now well understood; squid can be raised up through multiple generations. Scientists can rear aposymbiotic squid (without their bacterial symbiont) and compare their growth, survival, etc. to those with symbionts at a similar stage. The ease of culturing and a good understanding of the mutualism has allowed the relationship to be used extensively as a model system (used to understand a particular phenomenon) for studies ranging from co-speciation (two species evolving together) and biogeography (distribution of species) to gene regulation and the evolution of parthenogenesis (growth and development of embryos without fertilization). Thanks for reading. If you like what you see or have any questions leave a comment below. Don’t forget to subscribe to our blog and check out some of the other installments of Mutualism of the Month! Stay hungry.